Everyone Belongs @ Our Library! 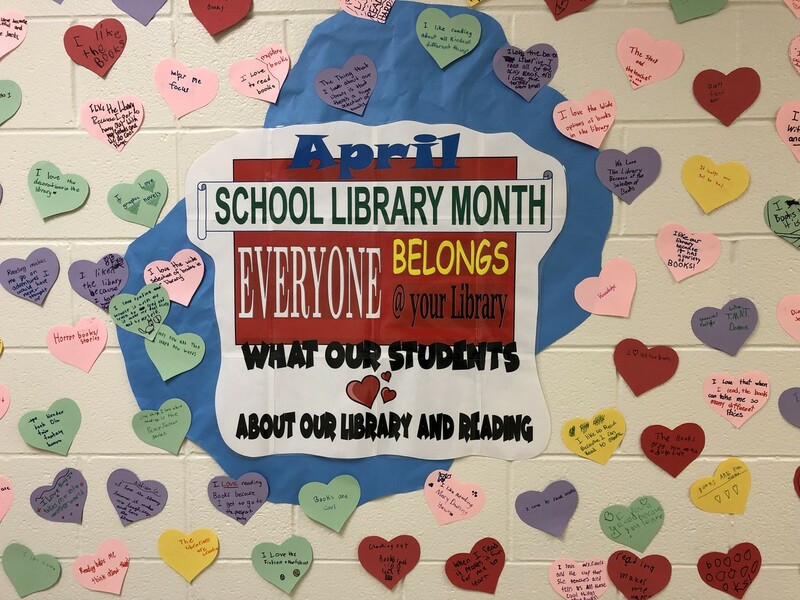 April is School Library Month, so the students took some time in their library classes this week to reflect on just what it is that they love about our library and reading. They wrote their thoughts on hearts that became part of our hallway display. Their sentiments included specific books/genres they enjoy reading; how reading makes them feel and how it takes them on adventures; book fair; picture book month; Global Read Aloud; Skyping with authors and other students; library decorations; Dr. Seuss week; etc. It was a good feeling to know that our library and reading means what it does to our students. Thank you to our district and school communities for seeing value in our school library! The 2019 theme is Everyone Belongs @ your School Library, and Dav Pilkey, creator of Dog Man and Captain Underpants, is the 2019 spokesperson. In the one minute video below, he shares the importance of school libraries and reading. What goes on "behind the scenes" in our school library? Besides the things that are easy to see like the 28 forty-minute library classes held every other week, and the school-wide reading programs and activities, there are numerous "behind the scenes" details that involve many people. Some of the tasks needed to keep the library current and running smoothly include: building relationships with students and helping them find that "just right" book or other resource, collaborating with teachers to see how we can help them with their curriculum and class projects, staying current with professional development and sharing what we've learned with colleagues, working with vendors and ordering up-to-date and relevant materials for students and teachers, weeding out-of-date and no longer used materials, repairing damaged materials, managing the library budget efficiently, overseeing the copy machine and laminator, conducting an annual inventory of our collection, and processing hundreds of books to get them ready for check-out. 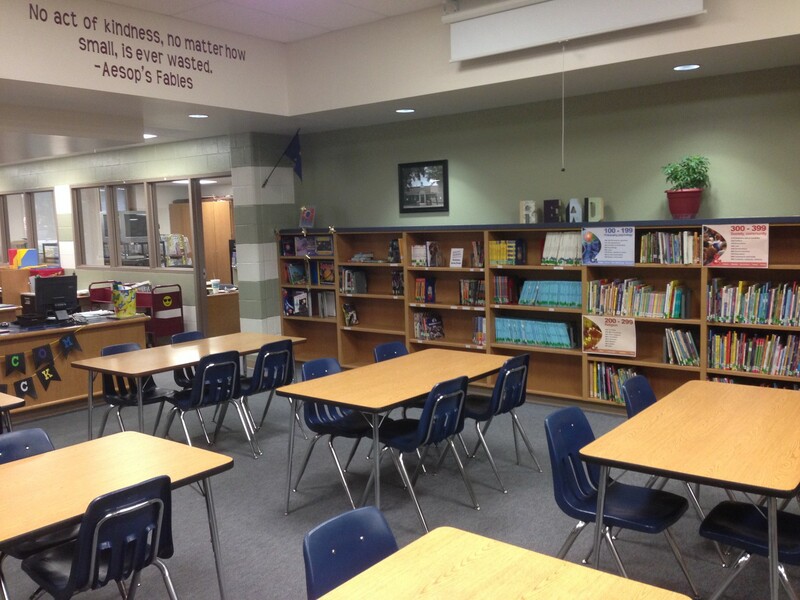 There is also the shelving of those hundreds of books, so they can be enjoyed by more students! We could not begin to do what we do in our school library without the help of many people. A huge thank you to our part-time library assistant, Mrs. Armstrong, and our volunteers who are always so willing to pitch in! The entire 3rd grade class had the good fortune of getting to Skype with Kate Messner this month. Kate is an award winning author who writes for all ages. Our 3rd grade teachers each read one of the Ranger in Time books as a class read aloud, then the students came up with questions that they wanted to ask Kate during our visit. It was such an exciting experience for the kids to hear Kate's answers to their questions. She shared her writing process with them and her new projects about to be released. When asked what his favorite part of the Skype was, Elijah stated, "I liked all the writing tips she gave us, and how she told us that the revising stage is the hardest part of writing for her." This was Kate's Tweet the day after our visit with her: Great morning of author Skype visits with readers in Michigan, Florida, Kansas, and Kentucky! I love when kids ask questions that relate to their own writing - these groups so clearly had stories in the works! It was an awesome experience, and we thank Kate for taking the time to connect with us! 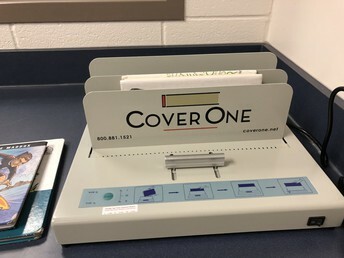 A Cover One Machine restores a book's damaged binding and enables it to stay in circulation. The spine is one of the first things to fall apart on a much-loved book. This tool will save us a lot of money in the long run. Thank you, PTA, for your help with this purchase! 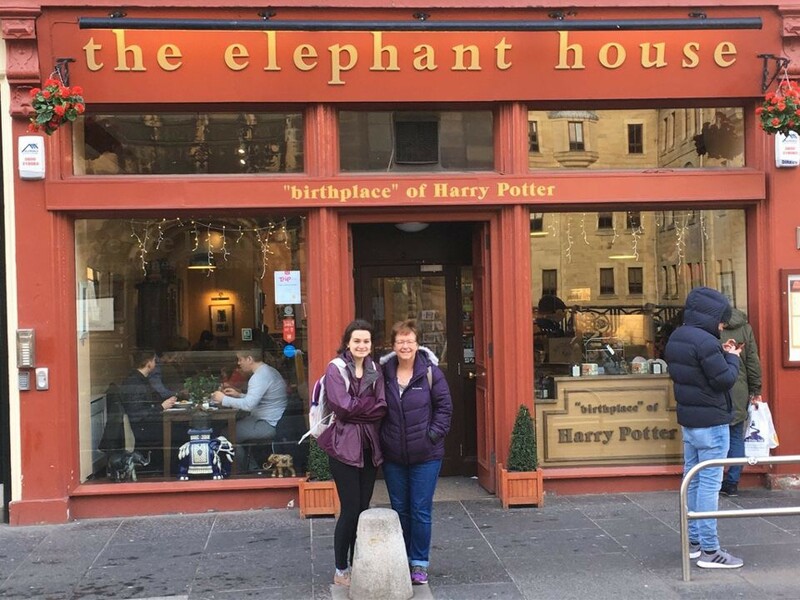 Mrs. Reinert and her husband were very excited to get to go to Scotland over Spring Break to visit their daughter who is studying abroad this semester. A literary highlight of the trip was eating lunch at The Elephant House in Edinburgh. 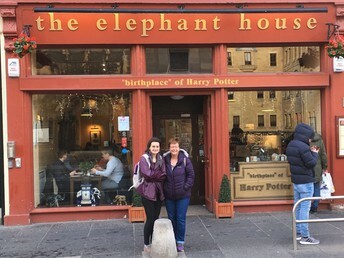 This coffee house is known as the "birthplace" of Harry Potter. JK Rowling was a struggling single parent when she would visit this coffee shop daily to work on the early Harry Potter novels. She would sit in the back room and look out the big windows at the nearby Edinburgh Castle while she wrote. It is said that she modeled Hogwarts after the castle. Adopt a Fish for the summer! The library's fish are looking for a new summer home. The Mitch Soden family have so graciously provided a home for them the past few summers, but their youngest, 6th grader Kaden, will graduate from WE in May. 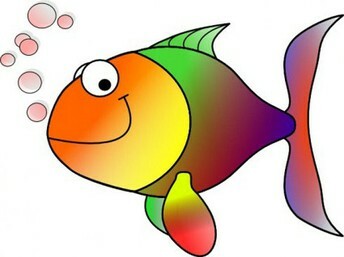 IF you already have a fish aquarium and are interested in acquiring a few more fish for the summer, please let me know. There are 7 small tropical fish ready to make some family very happy! We strive to make our library a welcoming place that fosters the love of reading and empowers the school community to become effective users of information.